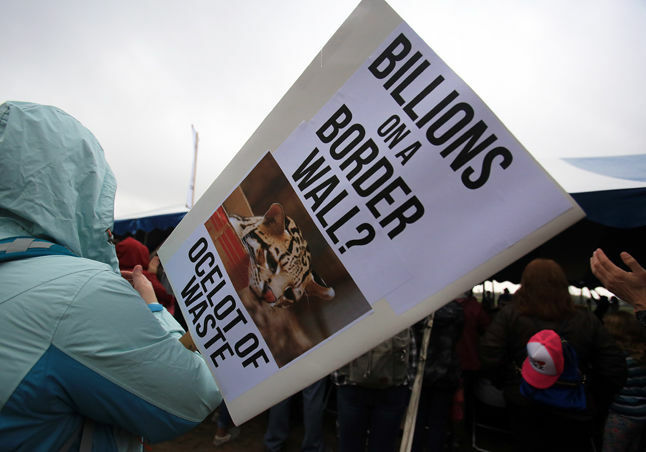 Anti-border wall signs are displayed as protestors voice their objection to the potential construction through the Santa Ana National Wildlife Refuge on Saturday, Jan. 27, 2018, in Alamo. ALAMO — More than 600 people gathered to celebrate the legacy of an historic refuge and simultaneously protest what environmentalists say is the federal government’s bid to irreparably damage it. With the Santa Ana National Wildlife Refuge as their backdrop, opponents of a border wall and legislation that would pit Dreamers against other undocumented immigrants urged attendees to pressure lawmakers to reject any deal that would include funding for construction that they say would all but destroy the refuge. Environmentalists established the refuge about 75 years ago as a sanctuary to protect migratory bird species, plants and other endangered animals. Recently, the president proposed to protect nearly 2 million Dreamers from deportation in exchange for $25 billion in border wall construction funds. Veronica Fernandez-Diaz, 22, a Dreamer herself who came to the rally with a group of fellow students from Colorado College as part of a borders and borderlands class, said it was important for her to visit the region and support DACA recipients and immigration advocates. The latest deal proposed by the president would essentially pit her future against that of her own family, Fernandez-Diaz said. She has a younger sister who is a U.S. citizen but both of her parents are undocumented. Scott Nicol, an executive member of the Lower Rio Grande Valley Sierra Club who helped organize Saturday’s event, said it’s a call to action for those who oppose any federal interference and destruction of the natural resources and communities along the U.S.-Mexico border.